Here we will post pictures of growth that other people have had with their upflow scrubbers. Don't forget to go to the last page of this thread, to see the new photos. To be notified when a new growth photo is posted, subscribe HERE (must be logged in), and select "Notification Type" to be "Instant Notification By Email". This first photo is of a customer's HOG3 or 3x or 3xx with really high nutrients in saltwater, which causes the dark growth. And the top part was out of the water, which acts as a bubble and salt-spray remover. 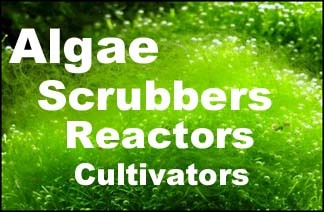 HOG scrubbers, because of the large vertical wall of Green Grabber rock surface, holds onto slime better than waterfall screens, and so can pull out nutrients in very high nutrient water when waterfalls would only grow slime that falls off. Last edited by SantaMonica; 09-30-2018 at 03:52 PM. Customer's SURF2 or 2x. Mixed dark and slime growth. That dark slime absorbs a LOT of nutrients from the water. Last edited by SantaMonica; 04-08-2018 at 08:48 PM. Customer's HOG3 or 3x or 3xx that is still new and has not filled in the middle yet. Last edited by SantaMonica; 11-18-2017 at 06:57 PM. Customer's HOG1 or 1x that could use less light, or some iron added to the water. Last edited by SantaMonica; 11-18-2017 at 06:58 PM. Customer's two DROP1.2x units in freshwater. Really dark slime needs brushing off in the kitchen sink, preferably one at a time, so the other one still is growing and filtering. Note how the strong LEDs penetrate though the growth in the box. Last edited by SantaMonica; 05-28-2018 at 02:49 PM. Believe it or not there is a HOG scrubber here; probably a HOG3 or 3x or 3xx because you can see a string or two. Last edited by SantaMonica; 05-28-2018 at 02:51 PM. Last edited by SantaMonica; 05-28-2018 at 02:54 PM. Customer's HOG1 or 1x below the waterline. This placement is good if salt spray is not an issue. Last edited by SantaMonica; 05-28-2018 at 03:28 PM. This customer's scrubber looks like one of our HOG1. Lots of Cladophora growth. Last edited by SantaMonica; 05-10-2018 at 11:29 AM. This looks like Ulva Fasciata species, growing in a customer's HOG1 or 1x. It is upside down in the photo. Last edited by SantaMonica; 11-18-2017 at 07:03 PM.